Bobbee Gerson, who recruited and organized the Gods and Goddesses for the Opening Ceremony where we "welcomed the Creator," did a great job of making sure no two people were dressing as the same deity. Unfortunately, that meant that all that was left by the time I got around to trying to claim a deity for myself were the, er, "lesser" deities. :) I literally volunteered to be 3 different goddesses that no one had claimed, but was told each time that someone else had JUST volunteered for that one. Fortunately, I remembered one unclaimed goddess I could still think of some way to put together: Ikebana, Goddess of Topiary, so minor a deity that she only appears in Discworld Noir! Hee! Unfortunately with how busy the first full day of the con was, I completely forgot to have someone take a good "posed" photo, but I have some that were taken for me from afar at the Opening Ceremony. - The gold leaves were intended to be a headpiece, and looked *ridiculous* and tacky when worn; and the gold ribbon to tie at the waist was too short to tie the way it should have gone to make the waist fit right; so I cut the headband and stapled it along the gold waist-ribbon like a wide belt, which made the waist fit better and the leaves more prominent a part of the costume. Made by the amazing Jean Tillson, who also made the Seamstress fascinators and jewelry for the NADWCon2009 Opening Ceremony, and my amazing pretty-much-half-a-hat fascinator, with the red feathers and the little gold bird for my Christine costume at the 2010 UK Discworld Con. She made this one out of white feathers and curly gold bits, and left a space for me to pin a pin I'd found at the local street market, which was 3 gold leaves together. The local street market. I was literally walking through it less than a week before the trip, in the extreme heat, devoid of sleep or any sense after an entire full day and night of working on the con, and thought, "I still need stuff for my costumes! GAH! I should look around as I walk home," and found a bunch of jewelry literally on the way home. Handy! Stuff I owned, from the 2008 Rock Band groupie costume and other costumes, except for the shoes, which are Chinese Laundry and have seen me through many weddings and fancy things and happen to look vaguely Greek goddess-ish. The bangles came from a mall accessory store (which is actually a really neat one with some Victorian-ish things, but I can't remember the name! ), and the body glitter and gloss are Wet'n'Wild, which is a fairly reliable go-to brand for outrageously sparkly/colored makeup. Put together for me by Sarah Goodman of the Seamstresses' Guild, bless her. About 2 weeks before the con I put out a general call to the Yahoo message board for any possible help with last-minute items, and several folks stepped forward to help me with them. In the end, I had everything I needed! Made for me by Erin Prindiville, our Art Show Coordinator and another member of the Seamstresses' Guild. She tells me she made them with curved blades to emulate a type of Japanese blade. Snip snip! The French Quarter, New Orleans! I got this right before the con, when I was visiting with queenanthai and her husband Karl. Karl took me around a bit of New Orleans and put up with me going into about 5 shops before I found a mask I liked. As soon as I saw this one I LOVED it. I actually had my Seamstresses' Guild Party nights mixed up so got a black one to go with the Absinthe Fairy because I thought the Genua party was Saturday or Sunday, but I wore it anyway on Friday because PRETTY SPARKLY SHINY WHEE! This was one of the first costuming ideas I had for this year's con, in main part because I thought it was a way to dress as a Seamstress and still be pretty comfortable doing it. And partly because the idea really amused me: in the sense that the costume would be considered totally scandalous and pretty much wearing your underwear outside in the Victorian era, but is actually more clothes than most people go to the boardwalk in nowadays. - I went to dinner outside of the hotel with a bunch of folks, all of whom were dressed completely normally, and I was wearing this. We were far enough away from the con hotel that I was, in fact, the only person in a burger-joint type place in a costume. I didn't even really realize this until we were sitting down. - The chemise and bloomers are made of the same matching material, but were hand-made by two different people. Etsy is a wonderful place. With Rob, who doesn't look nearly worried enough about the fact that I have a riding crop. 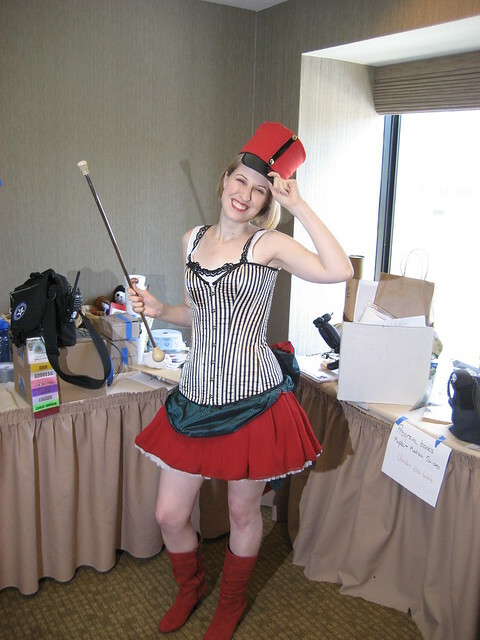 I owned the stiletto boots, which I bought for the UK Con last year to wear with another Seamstress outfit and when I was considering doing an Adora Belle costume. They are from Clockwork Couture, and are still available. I love that they're pretty comfortable for 4.5" heels, and that they have little rows of buttons up the sides. Caveat: they are not very breathable. Etsy! The store is vilicious, and the listing is here. The bloomers are adorable and she has lots of colors to choose from. The tricky bit: she doesn't do tops at all, only bloomers etc. However! She was happy to ship the remaining fabric from the bloomers to another Esty-er so I could have a chemise with matching materials. Hurrah! Etsy! The gal at fairestdesigns worked with me to do a custom order of 2 chemises, one to match the bloomers here, and one for my Clacks Girl costume. :) Then she shipped the leftover materials back to me along with the chemises. Very cool! Ebay. I don't know if it can still be found, but the store it came from is here. Jean Tillson again! Jean is so talented. I actually asked her is there was any way it would be easier for her to do a fascinator with one black feather base and two different centers, since both this costume and the Absinthe Fairy one could use a black base. She used Velcro for the middles! Genius! I love Jean and her fascinators. Okay, this is both not technically a Discworld costume, and my favorite costume of the weekend, because it was such fun to put together and I liked how it turned out. Basically I got the green corset, and loved it, and wanted to do the costume just because I wanted to wear the corset. 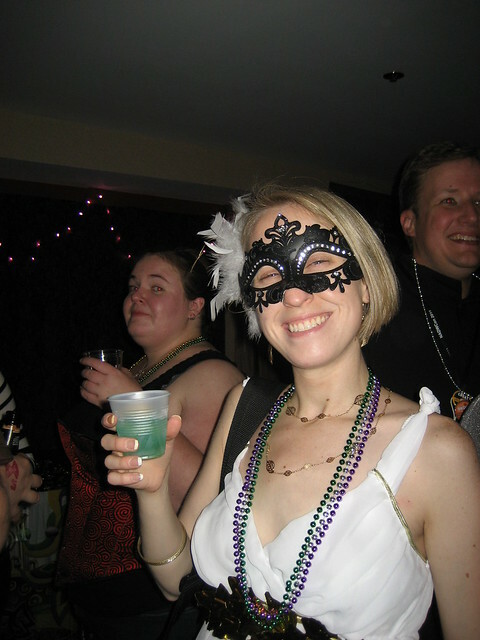 (And because the original suggestion from the store for how to wear the corset was to go out for Halloween as the Absinthe Fairy). It really is the perfect color for it. The Absinthe Fairy is now officially part of Discworld canon. Sir Terry hath spoken, and thus it is so! Or, in other words: Over lunch at the con, I argued the case to Terry for including the Absinthe Fairy in Discworld canon as one of the entities that logically could have come into existence during the events of Hogfather, because lots of people believe in the Absinthe Fairy. Terry: "Does she wear a corset?" Terry: "And very high shoes?" Emily: "Yes. And in fact, there is also a floofy little skirt involved." Terry: "Oh, well, yes, then, I certainly think that would be okay! Yes, I do give my permission." You can get these several places, but I think I got mine from Amazon? I can't recall. Despite the 5.5" heels, these are actually not too uncomfortable to wear (pretty much no more so than most heels), and I did not break an ankle or even fall down once all day! I needed someone to hold on to while walking downhill in the parking garage, because (as you can see if you look at the Amazon page) the front of the shoe goes up in such a way that level or uphill surfaces are fine, but walking downhill makes you feel like you might fall on your face. Heh. The black bloomers had adorable black lace along the bottom edges. The corset came from Clockwork Couture, although it is unfortunately no longer available. I luff it liek whoa. Jean Tillson! This is the same one as for Seamstress, Interrupted, but with the different velcro center. Nice! Amazon! Missy actually ordered these for me and brought them along, which was very helpful re: packing! These were made (or rather "assembled from parts") by me. Some of the findings (earring hooks, jump rings, silver chain, metal glue) came from my favorite local bead store, Beadazzled in Dupont Circle. They're always really helpful in helping you find what you need, and were also the source of the bright green glass beads that matched the corset perfectly. Other findings (silver charm trays, epoxy drops) came from Buy Just 5 Supply on Etsy, who were very easy to work with and put together a custom order for me. The absinthe bits (dollhouse-sized absinthe bottles, glasses, boxes of sugar cubes, tiny parchment pages with diagrams of the 3 main herbs used in absinthe, and "Absinthe Encyclopedias") came from Kaleidoskopic Romance. She was very helpful and also did a custom order. Everything is either held together with thread, jewelry glue, or being clamped together with pliers. The herb charms are jewelry trays with green nail polish (really) background and the parchment herbs over that; covered with an epoxy drop. Totally Costumes, but moderated with accessories, i.e. the aforementioned absinthe charms were added to this as well. This was actually done by My Lovely Roommate And Number One Minion, Erica, on the morning before I wore the costume (or was it the morning of...?) which was also when I finished most of the necklace and earrings, heh. The nail polish, which matches the corset perfectly and is a favorite of mine, is Sally Hansen "Glow." Wisconsin is known for several things, and one of the biggest ones is Cheese. Yes, in Wisconsin I really think it should be capitalized. 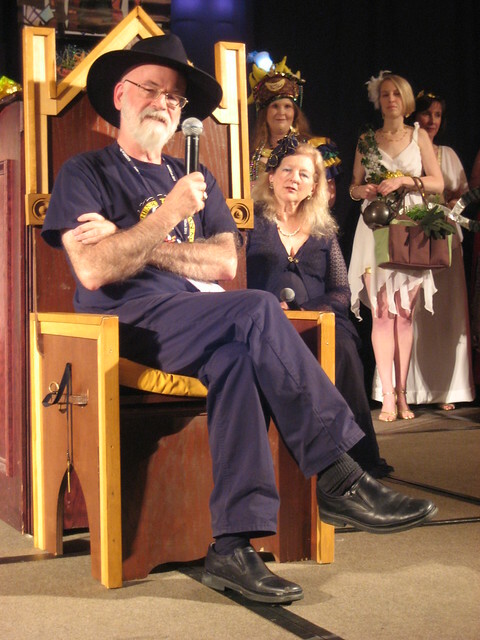 So naturally we wanted to work the local culture into the con, and thus, the Gala Banquet was set in Quirm, also known (in Discworld) for Cheese, and the banquet favors had to do with cows and cheese (see my posts on the Petite Quirmignon Cow for details). :P Somewhere along the way it was also determined that Jon and I should host the banquet (make the announcements and such) and that we should do so as the Duke and Duchess of Quirm. Therefore: I needed a fancy fancy Victorian-style dress but had none. Crivens! Of course when you need a full-fledged fancy dress, where else do you go but The Internet? And boy did it ever deliver! (I think I got more compliments on this costume than any other except maybe the Absinthe Fairy.) But more on that in a moment. Me with...hmm...well, I don't know that he was in any kind of character, so we shall call him A Gentleman of Quirm. I have to opine that while swamp dragons are chic accessories, bottles of champagne are even better. Remarkably, I had a fairly easy time finding a place that sold Victorian-style dresses that were at least vaguely affordable. 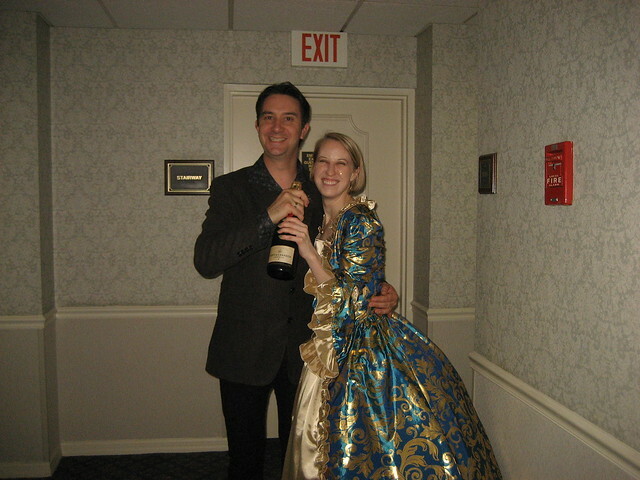 The place where I got mine is VictorianChoice2009 on eBay, and does both Victorian and Civil War style dresses. I found this one and liked it but didn't order immediately because I was looking into borrowing one. By the time I decided to buy, the listing had been sold. However! They were happy to list the dress for me again and make a new one, with the understanding that it might take a month to get it done. It actually was more like...3 weeks? Very fast service, and the dress is very nice! Mon, 15:23: RT @neilhimself: @foresthouse Always happy to lace up a damsel in that dress. Well of course I didn't have a hoop skirt lying around anywhere, having just purchased the sort of dress where you need one. *However* Jean Tillson again came to my rescue and lent me hers, with hoops and tulle layers. Note to those who haven't worn hoop skirts before: I recommend you wear something else underneath besides the skirts, because otherwise it feels weird (to me); I opted for shorts. Naturally swamp dragons need to be properly accessorized too, but fortunately my fancy dress came with a choker that I opted not to wear. Instead, it fit perfectly as my little dragon's collar. I wanted to make him a nameplate for his illustrious name, but sadly did not have time. I needed a new nice gold purse anyway. This one actually matched the middle part of my dress exactly. Excellent! Found the necklace charm and earrings at the aforementioned local street market. I love the charm - it's a little egg that actually opens. So cute. Haha! Told you those Chinese Laundry shoes are versatile. A lovely gift from the lovely Anna (aka Lady Bon Anna at this year's Friday ceremony, hee, and another member of the Seamstresses' Guild) that came from Asian Ideas. I've wanted to do this one for awhile, given that I have the Actual Green Bow that was part of the Actual Movie Costume. It was remarkably harder than you'd expect to find all the pieces, though! The costumes vary a bit, but I was aiming to get as close as possible to the outfit the front girl is wearing in that first photo. I didn't have time to make the little rose pin or finish what I wanted to do with the corset, but I think I got pretty close. Right after I had, errrrr, flashed Terry to show him I was wearing the Bloomers of A Dame. Heh. I actually tried a different place with traditional "cowgirl" boots for these first, but really didn't like them at all. It was *really hard* to find good red boots for this. But I was totally happy with these when I got them; and not least because they are comfortable, and are actual waterproof winter boots that I can now use this coming winter. Woo! Again, American Apparel's multi-layered petticoat is a wonderful thing. They also had a red chiffon skirt that was perfect. Well, Missy made me a cute pair of white bloomers, but I have to confess, after being presented with the special Bloomers of a Dame with writing on the arse the day before, I decided that if there was ever a time to wear them (as opposed to framing them on the wall, hee) Monday was that time! This was the other one made for me by fairestdesigns on Etsy. This one is cotton, with lace on the neck and back only to match the movie photo. eBay and RitDye. I can't find the eBay listing anymore, sadly, but the RitDye colors were a combination of Sunshine and Tea dyes. The lovely Marti of the Seamstresses' Guild answered my last-minute call for a baton and lent me her one from high school. Yay! Wow. I think...I think we're done here. WHEW. That was a lot of talk about costumes. But hopefully some of you enjoyed it! And now, a question: which one was your favorite? do you have a full shot with out the bag in the way of the goddess dress? I want a better look at what you did with the belt. Ok I REALLY like how that turned out. Lovely costumes, Emily. You seem to have put in an awful lot of work for someone who claims to not put in an awful lot of work. I always find if you pick a character that's obscure enough, nobody else will have the costume. It comes with the drawback of noone working out who you are, either, but thems the breaks. For Nullus Anxietas 3, I stuck with only 2 costumes. I mostly did this one for our "Wossnames" panel, which is based on a very old innuendo-filled Australian Game Show, Blankety Blanks. The character has his most prominent role in the Reformed Vampyre's Diary, with a minor cameo in "Thud!" Hence, relatively unknown! Saturdy Gala Dinner: Our theme was "Dine with the Gods" so of course I had to pick a god for this. In the end, I went with Cephut, Djelibeybian God of Cutlery. He's not actually ever appeared in the books, but a Priest of Cephut is in Pyramids. This gave me the freedom to make up the costume as I liked. Here stands Cephut, pictured with his counterpart, Annoia. In fact, people kept asking if I was the male version of Annoia - despite the fact that she didn't appear in any of the novels until well after Cephut was mentioned! This costume was a little bit of a cheat, but considering I dreamt it up and built it during four days off work when I had a fever, I figure that's fair enough. I bought a cheap extendible plastic brush (for sweeping cobwebs or something) and removed all the bristles, then sprayed it silver. Then I took a cheap oval serving dish, cut off its wide brim, cut out tines, and attached it to the bristle-less brush-head with wire. Once the whole thing is painted silver, it looked pretty good. The handle is collapsible, so the whole thing could be pulled apart and fit inside my suitcase! Those sound like fun costumes! I had the problem of no one recognizing me when I went as Christine for the UK banquet last year - even with my dead roses, only a few people got it right off! Ahh, everytime someone on my flist posts pictures from ANY con I get so jealous! I love costuming, and rarely get the chance to do it (which is why I go all-out for Halloween, lol). I think I have decided that the next NY Comic-Con, I will have to make the trip. Thanks for the compliments! 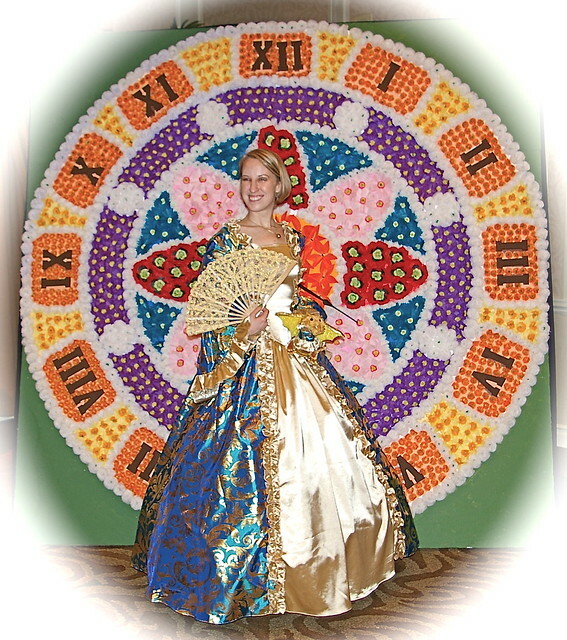 I really loved wearing the Duchess dress, even with the craziness of hoop skirts - definitely fun to wear! 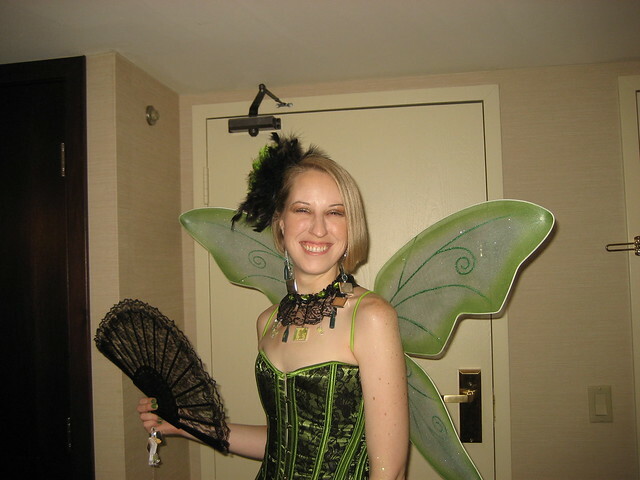 There was a great Absinthe Fairy I ran into at Dragon*Con while wearing my costume; totally different take on it, and yet we were both recognizably the Fairy. :) Hers was awesome, too. The Clacks Girl I like a lot too, AND it's fairly comfy. Are you going to NYCC next weekend? I'll be there Sunday! Oh, Neil and Terry are fantabulous, no question. And Etsy is great, too - I have the same problem with wanting to buy everything! Heh. I personally love the Clacks Girl, but that's because it's such a playful costume. I'd do costuming, but am so seriously lazy that I've been tempted to be Anoia. I have a bedsheet, rope and tons of cutlery. I did have fun putting the Clacks Girl together and wearing it. I definitely want to wear that one again. My main problem is that I had to tear up the hat Erica made me, because it wouldn't fit in the luggage but I wanted to keep the parts so it could be made again. Heh. Nice costumes! I like the last one best.